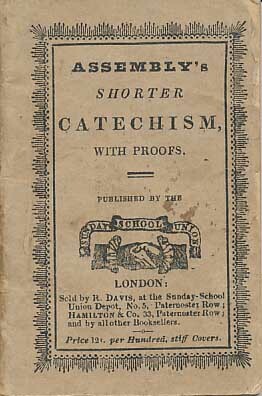 It was on this day, November 25th, a Thursday in 1647, that the British House of Commons ordered the printing of the Shorter Catechism, composed by the Westminster Assembly. The Westminster Assembly of Divines had first met on July 1, 1643, having been summoned by the two Houses of the British Parliament to advise as to a further and more perfect reformation in the liturgy, discipline, and government of the Church of England. They immediately set about working on a revision of the Thirty-nine Articles. When the Commissioners sent by the Church of Scotland arrived to be seated as part of the Assembly, the work then began to take on a wider scope. The Assembly was now required to prepare creeds and directories, not for the Church of England alone, but for the Churches of Christ in the three kingdoms, so as to bring all of them into the nearest possible uniformity in doctrine and practice. The documents which are today the authoritative secondary standards of so many Presbyterian Churches throughout the world (and not just English-speaking churches), were prepared by an Assembly of English Divines, men who were episcopally ordained clergymen of the Church of England. That Church was as yet undivided at that time. The members of the Assembly represented the different views of doctrine and order that were entertained within it. Many of the prelatic party who were nominated by Parliament declined to attend the Assembly, but others of them took the required oath, and assisted in the deliberations of the Assembly, at least for a time. The Independents [or Congregationalists, by another term] were represented by seven men who came to be known as the “dissenting brethren” in the Assembly. The great majority of the members of this Assembly held Presbyterian views of Church polity, and were the successors of the Puritans, who formed a considerable body in the Church of England from the time of the Reformation. They had all along been working for a more primitive organization of the Church, and a freedom from the practices and priestly robes borrowed from the corrupt Roman Church. In the days of Elizabeth they had instituted a voluntary Presbyterian organization of the Church, and they had often suffered in her days, and during the reigns of James and Charles, for refusing to carry out the practices or wear the robes enjoined by the prelates [or high-Church Anglicans]. To this Assembly were added three ministers of the Reformed Church of France, and four learned divines of the Church of Scotland, who were seated as non-voting members, but whose voice carried great weight in the deliberations of the Assembly. The committee first charged with the work of preparing a Catechism never managed to complete its work. Some time later, the Assembly directed that both larger and a briefer catechisms should be produced, both works keeping an eye to the content of the Confession of Faith. Work then proceeded, first on the Larger Catechism, and only as that work was nearing completion did the Assembly turn its attention again to a Shorter Catechism. A new committee was named and by most accounts, the successful completion of the work is due to the efforts of just four men, and in particular the work of Antony Tuckney, Minister of St. Michael’s, London, and Master of Emanuel College, Cambridge. Completing their work, the committee presented its report to the Assembly. After some revision of the Catechism, the addition of the Commandments, the Lord’s Prayer and the Apostles’ Creed were considered. A vocal minority opposed the addition of the Apostles’ Creed, and to settle the matter, the Assembly determined that an explanation of the words “he descended into hell” would be added as a marginal notation. That postscript is typically not found in the American editions. The work now finished, a message was prepared by a committee to be addressed to the Houses of Parliament when the Catechism was carried up. On Thursday, 25th of November, 1647, the House of Commons was informed that divers divines of the Assembly were at the door. They were called in, and the Prolocutor [moderator of the Assembly] delivered the Catechism and addressed the House. On the following day (November 26th) the Catechism was carried to the Lords. Each House thanked the Assembly for its care and pains in this matter. It was ordered that 600 copies be printed under the care of Mr. Byfield, for the use of the Members of Parliament and of Assembly, and that Scripture proofs be affixed in the margin of the Catechism. One characteristic of the Shorter Catechism has not been sufficiently recognized in the past. It is a statement of personal religion. It appeals to the individual sinner, and helps the individual believer. There was an old expression, particularly among the Scottish Presbyterians, who would say, “I own the Confession.” By that, they meant that they had made its doctrine their own; they had taken the content to heart, and saw that indeed it was an accurate reflection of the teaching of Scripture. So too the Catechism, though briefer. Reader, do you own the Catechism? Have you made it your own? Clearly it is not Scripture; no such claim is made, and that is why we speak of it as part of the secondary standards of the Church. But it is worthwhile reading, and a great help in understanding what the Bible teaches. [The bulk of the above was based on and freely edited from an historical account written by William Carruthers [1830-1922], which is found bound with a facsimile reproduction of an original printing of the Shorter Catechism. A digital edition of that work is available here. 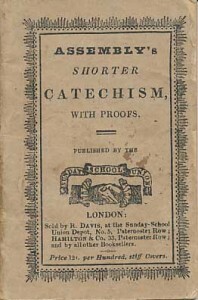 Image source: Pictured is a later edition of the Westminster Shorter Catechism, not the original first printing. PreviousFalse teaching disqualifies anyone from teaching! Let’s look at what Beth Moore is teaching.